I am not a fan of summer. Forty degree days, sunburn, public transport chaos, and sweating without even moving are just not my idea of fun. I survive by staying indoors, closing all the blinds, sitting in front of the fan, and obsessively checking the Melbourne real time temperature update in hopes of a cool change. Also drinking iced drinks. I can’t remember where I first encountered the idea – it was no doubt and excellent blog that I’m neglecting to credit. Wherever it came from, it solved my coffee addict/heat despising dilema. The idea with cold brewing (apart from not having to cool the brew down) is that you get all the flavour without the bitterness. I have to say, it really works. And it’s really simple. Take a largish jug or other easy-to-pour from container, add a tablespoon of coffee per cup of water, and allow to steep for 12-24 hours. Strain through a fine sieve or a colander lined with cheesecloth into another jug. Serve sweetened or milked to your liking. I like it with a teaspoon of dark agave, some Bonsoy, and lots of ice. The same method can be used for tea as well, although I’d advise brewing for a shorter time to avoid it becoming too tannic. 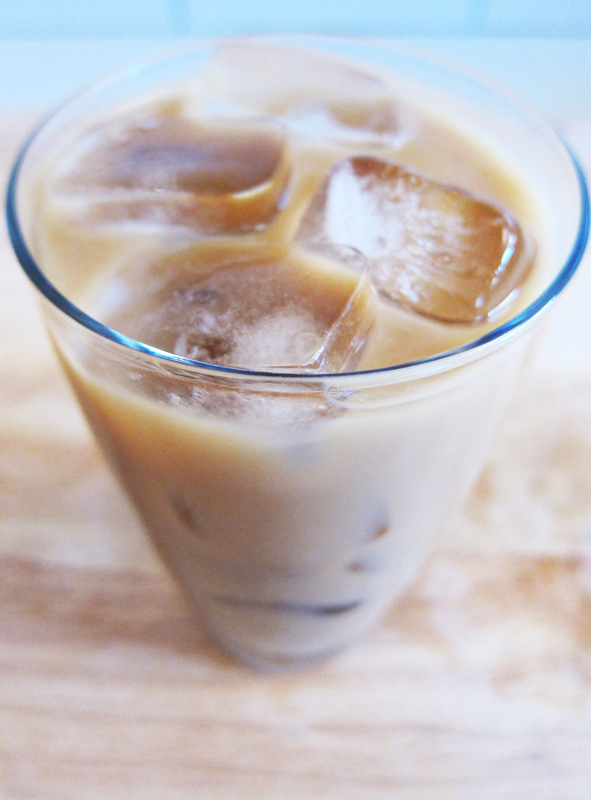 I’m particularly fond of cold-brewed chai, again with agave and soy milk. Inspired by the drinks at countless dumpling houses, this couldn’t be simpler, and works well with just about any canned fruit. Mangoes are my other favourite. You can also turn these into an adult beverage by adding the white spirit of your choice. I use three trays of ice cubes to one large (560g) tin of lychees, which makes a little bit more than two of my glasses full. 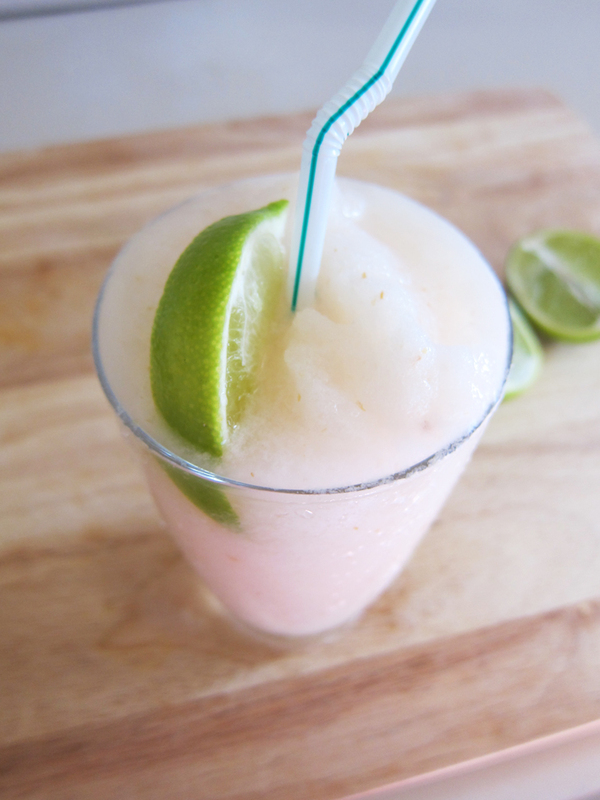 Put the ice and lychees in a blender and blitz until they reach whatever consistency you like. Pour into tall glasses and finish with a squeeze of lime. Drink and be cool. 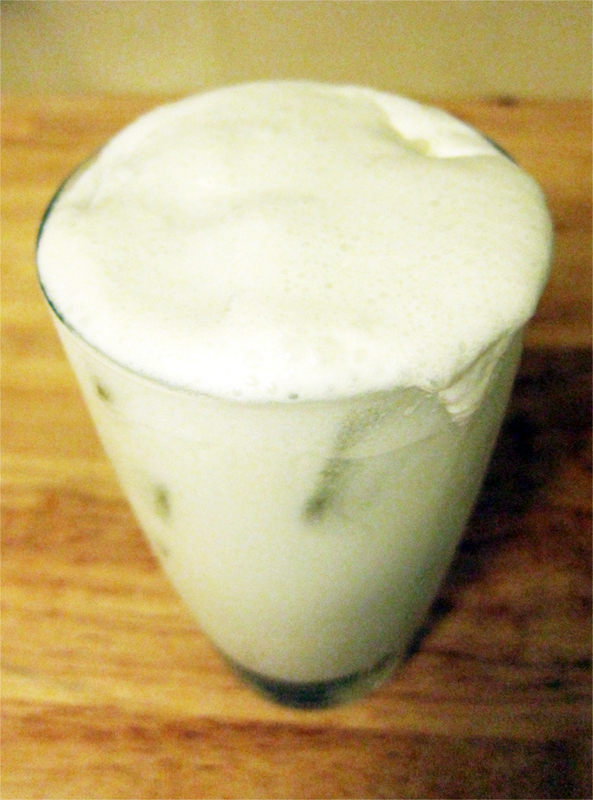 These aren’t ‘proper’ pina coladas by any means, but they are delicious and they get the job done and I usually have all the ingredients in my pantry, avoiding the necessity to leave the house and walk around in the heat. Much better to stay in and drink. Fill your blender half full of ice. Add a tin of coconut milk, a large tin of pineapple pieces (in syrup or juice according to your sweetness preference) and a good bit of white rum (again, according to your preference). Blitz until the ice is crushed and the whole thing looks creamy and delicious. Pour into glasses, drink, and be glad summer at least gives you an excuse to indulge. Also be glad that, even though the fading light means your photos turn out badly, there should be a cool change coming soon. Chocolate stout cake. Bourbon icecream. Bourbon salted caramel sauce. Yes. This is the kind of desert you make for someone you love. You make it for them because their favourite drink is a boilermaker (beer with a chaser), and one wintery Melbourne evening while waiting for a tram you had a flash of brilliance and figured out how to translate that into desert form. You make it for them because you’ve had that Chocolate Stout Cake recipe bookmarked since forever and a very generous friend just gave you an icecream maker and this is the perfect excuse to try them both out. You make it for them because they love you, too, and will forgive you when the whole centre of the cake collapses because you still haven’t quite figured out the quirks of your oven yet. And when you spin your decorative sugar strands too early and they collapse in the humidity of the kitchen and turn into strange chunks of toffee sculpture rather than the pretty, delicate nets you envisaged. 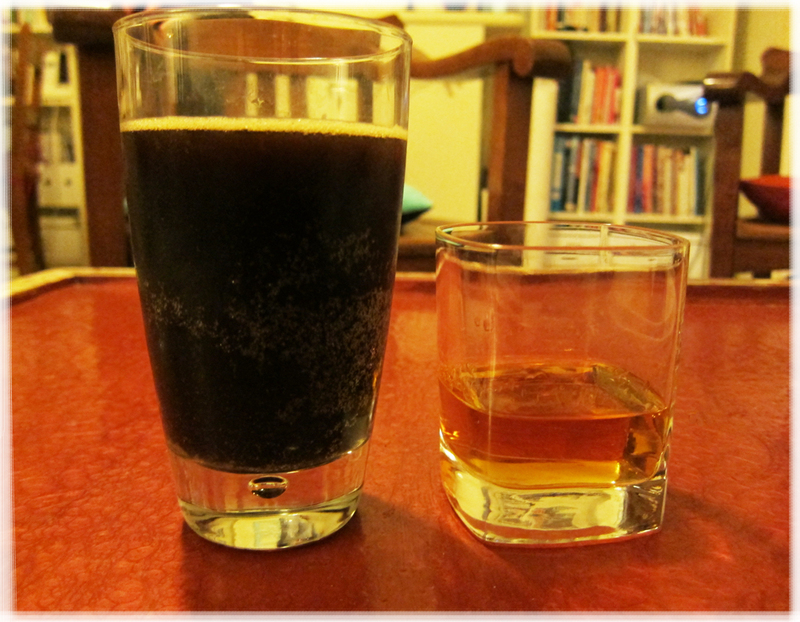 Chocolate stout and bourbon. Yes. The cake recipe is from Smitten Kitchen. 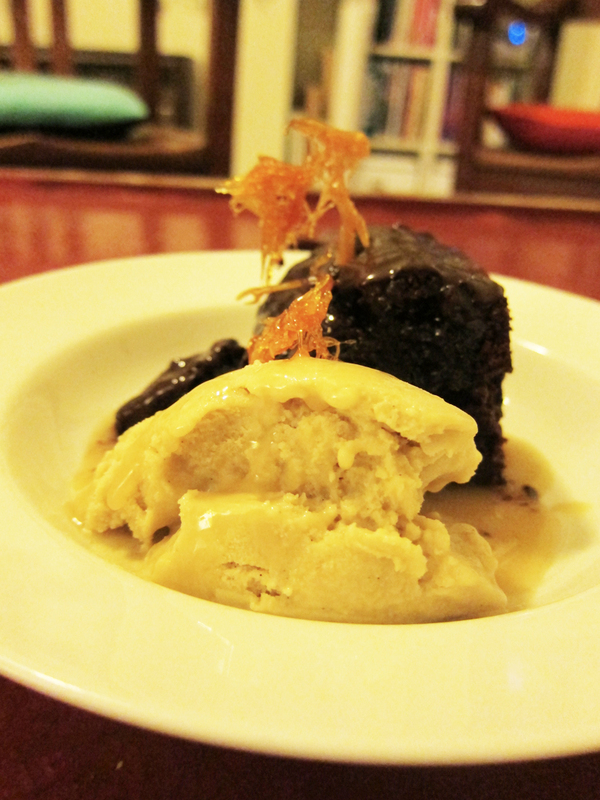 The bourbon icecream and bourbon salted caramel sauce are from Ezra Pound Cake. You should put them together and make this desert for someone you love. Maybe that’s you? One of the things I love about where I live is that I’m just a few minutes walk from Carlisle Street’s abundant food choices. One of the newer options is Ilona Staller, and I’m mighty pleased to have such a fancy local. I end up eating there far too often – and far too much – for my budget, but in my defence it is really close and really good! They have a fairly short menu which changes regularly and always has a couple of good vegetarian options. Recently, one of those options was a mushroom rotolo. I’d never heard of rotolo before, but I’m glad I have now. 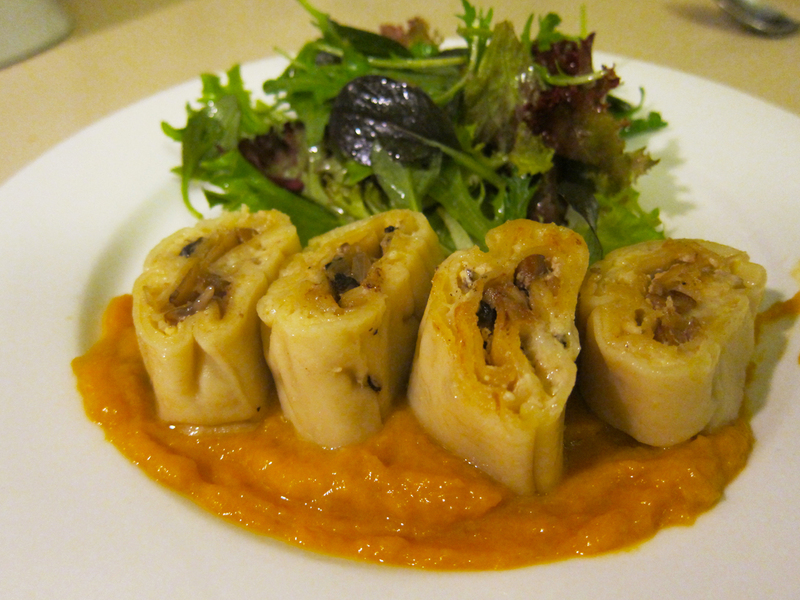 Rotolo is like a rolled lasagne which is poached and then sliced into thick rounds (did you know that already?). The pasta was soft and comforting, the mushroom filling deeply flavoured, and there was lovely cheesyness. I liked it so much that I decided to make it myself as soon as I could. Like, the very next day. I did a quick google search to get a sense of the method, but I pretty much made it up as I went along. In an imitating-other-people’s-brilliance kinda way. And a made-a-lotta-lasagnes-in-my-life kinda way. The one essential thing I learned from the vast array of rotolo recipes on the internet was how to wrap the rolls cloth to poach them at the end. The poaching avoids the hazard of dry lasagne, making the pasta soft and amazing. The other trick is to add a bit of vegetarian mushroom ‘oyster’ sauce to the mushrooms. I learned about it when Hanne Blank made me these vegan mushroom dumplings when I visited her in Baltimore at easter. It adds an incredible deep mushroomyness that’s just amazing. I also spread a slick of dijon mustard across the lasagne sheets before adding the other fillings. I’ve been a bit obsessed with this technique ever since I made Smitten Kitchen’s Cauliflower and Caramelised Onion Tart – it adds something subtle but amazing. I also spread some Greek yoghurt over the mustard for a little extra tang (actually mostly because I wanted to use it up before it turned). And it was good. The whole thing was a bit of work for a weeknight dinner, but it’s not too onerous and it is utterly delicious. Start with the mushrooms. Heat some olive oil in a pan and add the onions. Prod for a few minutes until they get a bit translucent, then add the mushrooms and garlic. Cook over medium heat until everything softens up and turns a lovely caramel colour. Add the mushroom sauce, season to taste, and set aside. 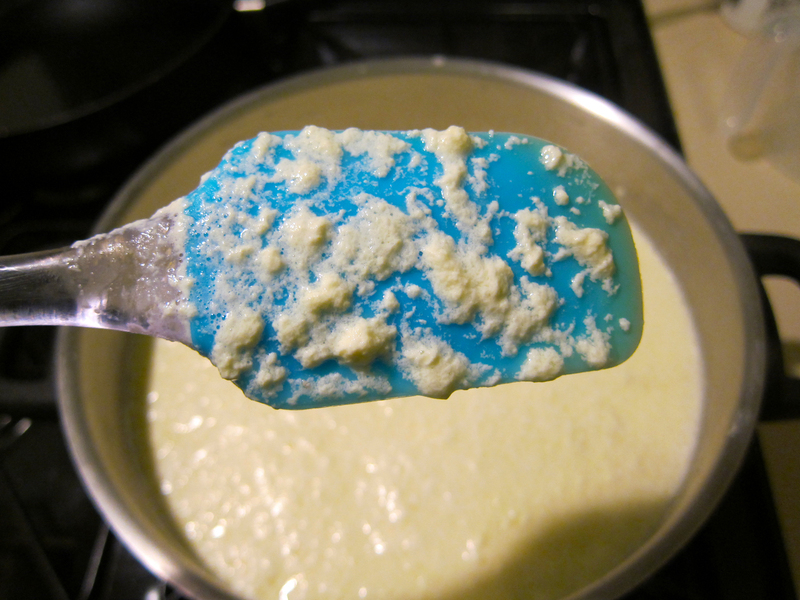 To make the bechamel sauce, melt the butter in a medium saucepan. Add the flour and stir cook for a few minutes, stirring constantly. Add the milk a little at a time, making sure it’s thoroughly incorporated before adding more. 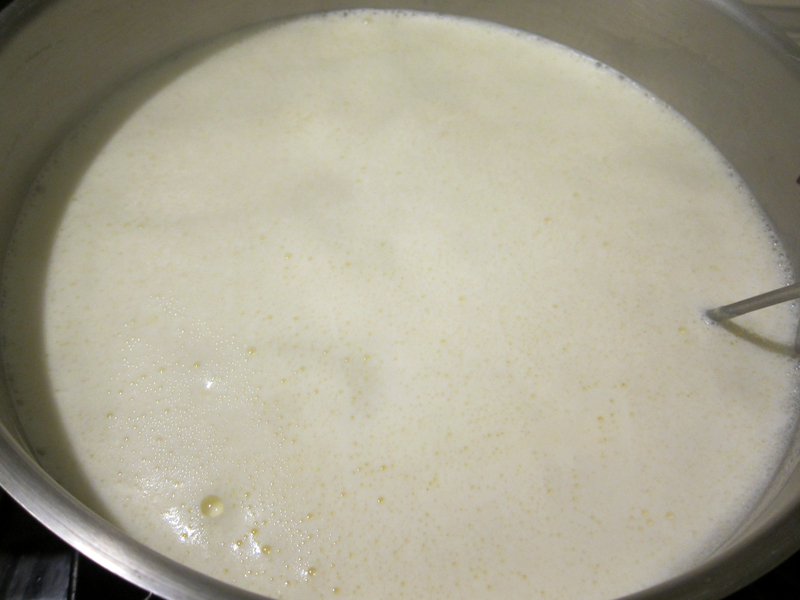 Once all the milk has been added, cook over medium heat, stirring constantly, until the sauce starts to thicken. Remove from heat, add the cheese, nutmeg, and seasoning. To assemble, lay a lasagne sheet on your bench. Spread a teaspoon of mustard over the top third. Follow with a tablespoon of the yoghurt. 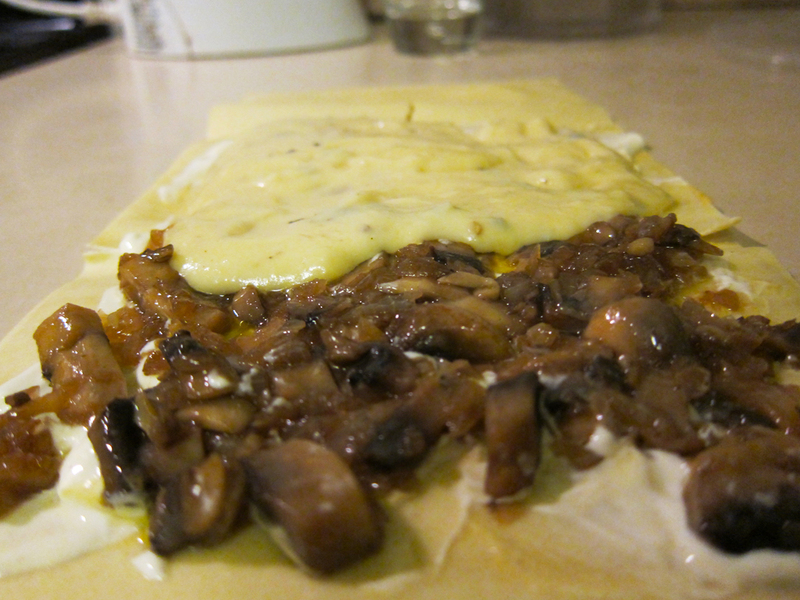 I spread the mushrooms over the the top two-thirds, then the bechamel a little further down so I got pure mushrooms in the centre, and cheese sauce holding the outside layers together. Roll up the sheet and wrap tightly in muslin or a clean teatowel, making sure you secure the ends (a few good twists should do the job). Carefully arrange the rolls in a large deep frypan or saucepan. Pour in enough boiling water to just cover the rolls. 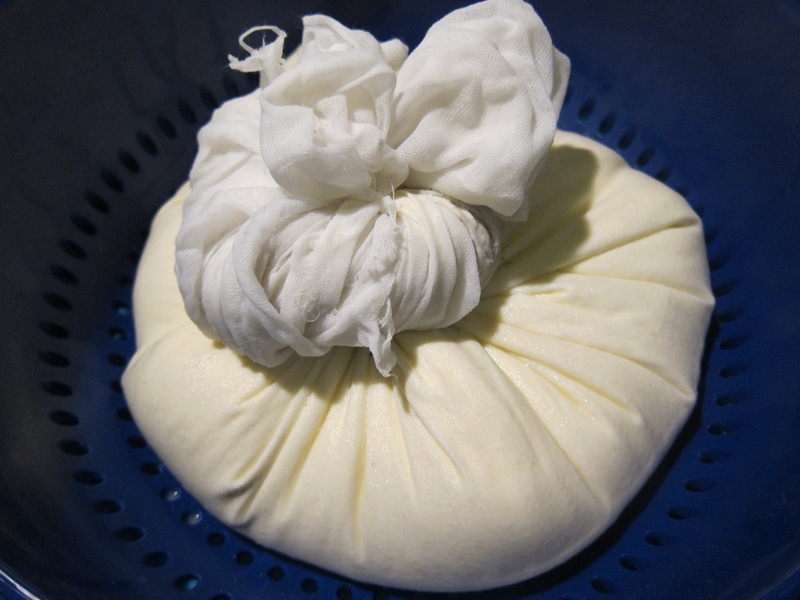 Cover and place the pan over medium heat – you want to just gently poach for around 15-20 minutes. Once the rolls are done take them out of the pan, unwrap, and slice them into four or five thick slices. I served mine on pumpkin mash because that’s what they did at Ilona Staller and I happened to have a chunk of pumpkin in the fridge, but you could also just spoon over a little bit of passata and call it delicious. I’ve been a big fan of Mr Nice Guy cupcakes since my awesome friend Georgia introduced me to them. 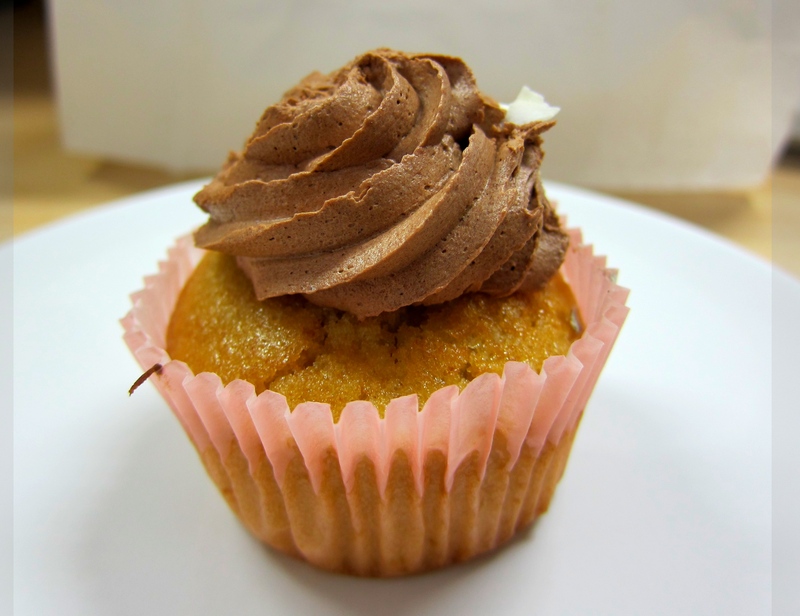 My first Mr Nice Guy was some kind of amazing berry amazingness that was the perfect cupcake – light, moist cake with sweet-but-not-too-sweet flavoursome icing. So as soon as Cindy & Michael posted about the new Mr Nice Guy Cafe in Brunswick (which happens to be a 10 minute walk from my office) I had to go. Unfortunately, the cafe isn’t open on Tuesdays, so I had to wait a couple of days…and now it’s taken me a couple of weeks to write this up. The cafe is at the Noise Bar on Albert St in Brunswick. It’s full of couches and has a few ‘proper’ tables as well – a blessing for those of use with a habit of spilling food in our laps. It’s actually quite a charming space, although pretty quiet – I was the first person there when I walked in at 12:15, but a a couple of other groups came in while I was eating. Along with the famous cupcakes, Mr Nice Guy also serve vegan tex mex and crepes. I had the quesadilla with vegan sour cream on the side ($2 extra) and it was damn tasty, although I wanted something more from it – a bit of fresh salsa would have made everything amazing. I went specifically for lunch, but there was also no way I was leaving without a cupcake. 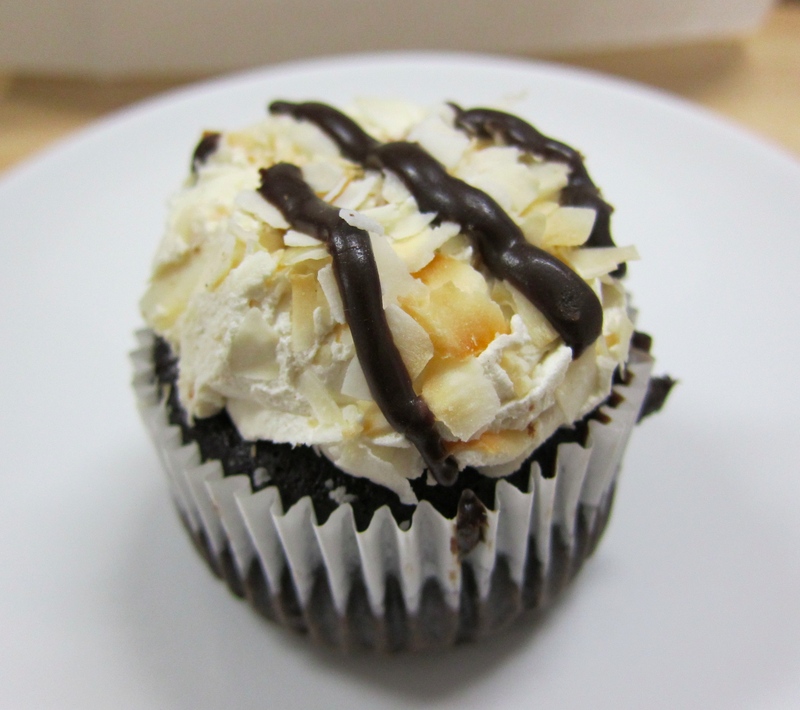 I picked the Betty White: chocolate cake with coconut icing and flakes of toasted coconut on top – it’s like a bounty bar in cupcake form. Crepes layered with lemon cream cheese and glazed with berries. As a thank you for the camera use, I got a bonus free cupcake! 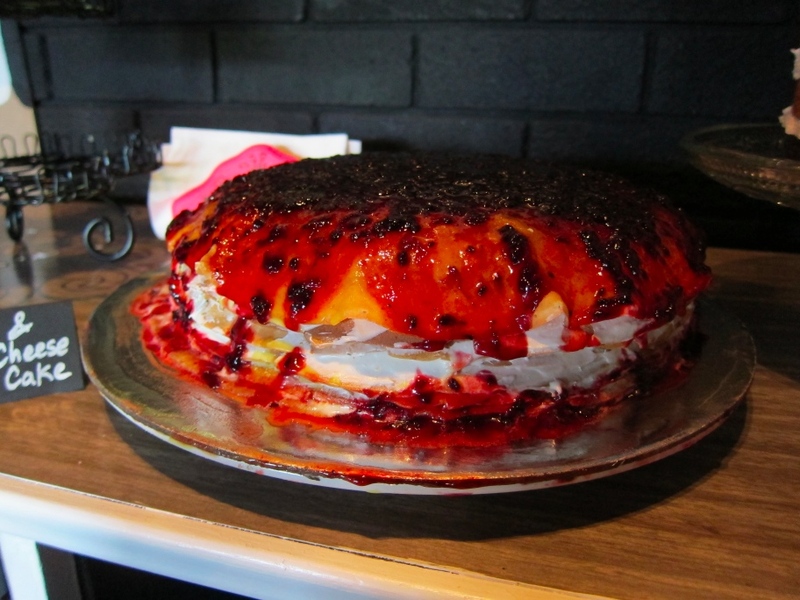 It was gorgeous – rosewater cake with a chocolate icing – so tasty! The verdict: great space run with a complete lack of pretence, relaxed service, and tasty, tasty food. I hope they get the custom they deserve and keep on serving up delicious vegan food to Brunswegians for a long, long, time. The first thing I have to say is that this isn’t really ricotta. Ricotta is made from whey, and this is made from whole milk enriched with cream. It’s like super-rich, lightly salted, fresh homemade paneer. And it’s delicious. The second thing I have to say is that I’m totally obsessed with it. I saw the recipe on Smitten Kitchen and I’ve made it three times now. I kept forgetting to add the salt after the first batch, but I don’t think that takes too much away from it. Seriously. So good. The first time I followed Deb’s recipe exactly (opting for the lower cream:milk ratio; no idea why). It was a little grainier than I’d like, but still delicious. I mixed the fresh curds with some extra lemon juice and tossed with some just-steamed green beans and toasted almond flakes. Perfection. The second time I made it to use up dairy products leftover from other recipes (I’m usually a soy kinda girl). I didn’t measure anything, just tipped the leftover milk and cream into a pot and heated it up. I used leftover yoghurt for the acid, and when it didn’t curdle quite enough, I added a bit of extra lemon juice to get things going. This was incredibly creamy, sweet, and amazing, and dear Maude I wish I’d measured things so I could repeat it. I scoffed it all with a spoon and you better believe I’m going to experiment with higher cream ratios and yoghurt coagulants until I can reliably reproduce the results. The third time I made it, I decided to stop mucking around with polite quantities and just go for broke. I made a-bit-over-double the original recipe with a cream ratio somewhere in between the two previous attempts. I also miscalculated the acid ratio and used nearly twice the required lemon juice, but it still came out creamy and seriously good. Better than deli ricotta for about two-thirds the price, and seriously better than supermarket tubs. I keep sneaking back to the kitchen to eat it by the spoonful as I type. If you don’t eat the whole lot at once, you have more restraint than me. You should also transfer it to a plastic container and keep it in the fridge – it will keep for a few days (if it lasts that long). 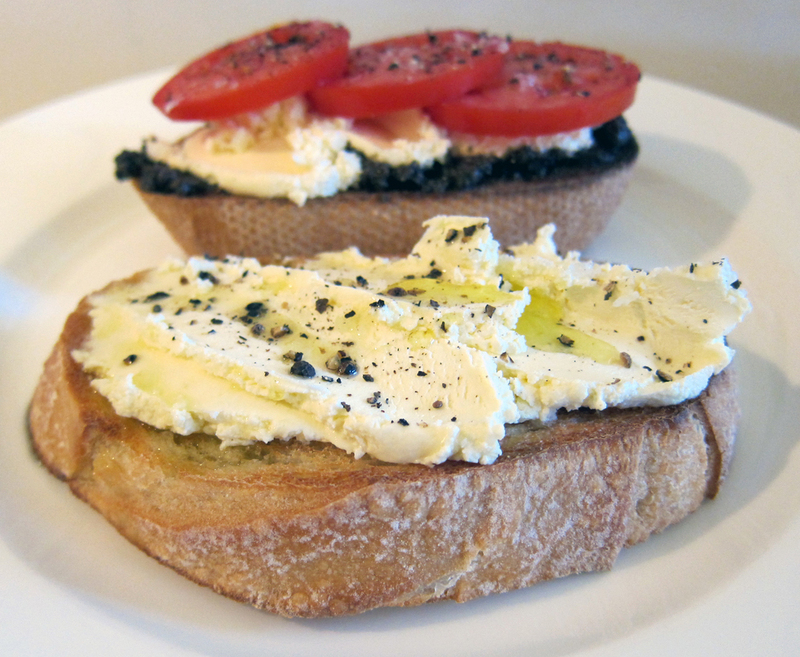 It will also firm up a bit – mine ended up with a texture and mouthfeel similar to mascarpone. Heat the milk until it's foamy. Curdled milk. This is what you want. If you’re after a more reasonable amount, you should probably go use Deb’s original recipe – but go for the higher cream content. Despite Deb’s claims, I think it makes a huge difference, but my experiments have not been as scientific as hers. If you’re after an unreasonably large quantity, use the measures below. I guarantee you won’t regret it. Combine the milk and cream (and salt! don’t forget the salt!) in a large saucepan. Place over medium heat. If you have a candy/deepfry thermometer, heat to 85C (190F). If you don’t have a thermometer, heat until just below boiling (there will be foamy bubbles on the surface). Turn off the heat. Pour in the lemon juice and stir gently – you should see curds start to form. If that doesn’t happen, add a little more lemon juice, 1 tablespoon at a time, until they do. Leave to sit for a few minutes. Allow to drain. The longer you leave it, the drier it will be. If you’re making the large quantity, you may need to empty the whey from the bowl every so often. To eat: Spread on toast. Mix through pasta. Drizzle with olive oil. Drizzle with honey. Serve with fruit. Or tomatoes and basil. Or just-steamed green beans and toasted almond flakes. Or grilled eggplant or zucchini or asparagus. Or just grab a spoon and go for it. No judgement here. You guys, did you know that celery is, like, a real vegetable? That you can cook? As the main ingredient in a dish and not some tiny, background component? And it would be delicious? You did? Well, I didn’t until just now! I still had a heap of veggie box celery left over after my Waldorf Salad efforts, and not having much of an idea what to do with it, I Googled “celery recipes” for inspiration. At the bottom of the page amongst the oh-so-helpful search suggestions was the phrase “braised celery recipes” and that was all I needed. I may have even clicked on that phrase and flicked through a couple of the recipes, but I already knew what I was going to do. The thing about braising celery is that it changes everything. There’s no bitterness, no stringiness, no aching jaw after all that crunchy. Rather it melts into a tender, sweet-yet-deeply-savory deliciousness. I can’t quite explain it. You’ll just have to make it for yourself. Wash the celery and chop into 1-inch lengths. Heat a slug of olive oil in a large pan and cook the celery over medium-high heat, stirring occasionally, for 5 minutes. Meanwhile, peel the potatoes and cut them into 1-inch chunks. Add them to the pan along with a pinch of salt and cook a further 5 minutes. Everything should colour up slightly. Add the garlic and stir through, then pour in the wine and stir, scraping the bottom to get all the bits up. Allow it to reduce a bit. Add 1 cup of stock, cover and simmer, stirring occasionally. Keep an eye on the liquid levels and add more if it’s getting dry before the potatoes are cooked. The dish is done when the the potatoes are tender and almost all the liquid is gone, leaving a glossy coat all over everything. Stir through the lemon juice and parsley. Have a taste and season with salt and pepper. Spoon out into big bowls, grab a fork, and get to know your celery in a whole new way. One of the things I thought I’d really miss when I first went vegetarian was winter stews – slow-cooked, deeply flavoursome, alcohol-infused, meaty winter stews with thick, rich gravy. 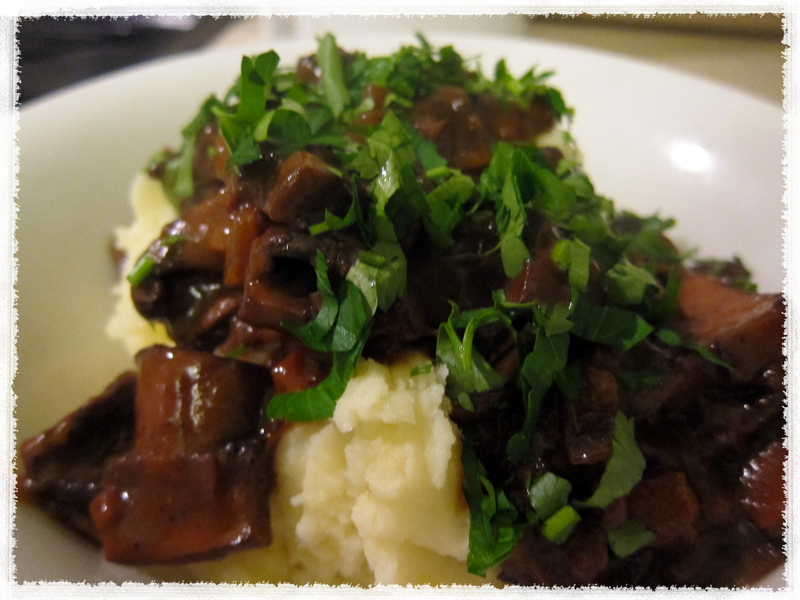 It didn’t take me long to figure out some very satisfying vegetarian alternatives, but this mushroom bourguignon from Smitten Kitchen is one of the best by far. As Deb says, “most of the things people thought they liked about meat they actually liked about the sauces and braises and spices they were cooked in” and I think this recipe proves that. It’s rich, indulgent, warm, and comforting. It’s everything you want it to be. 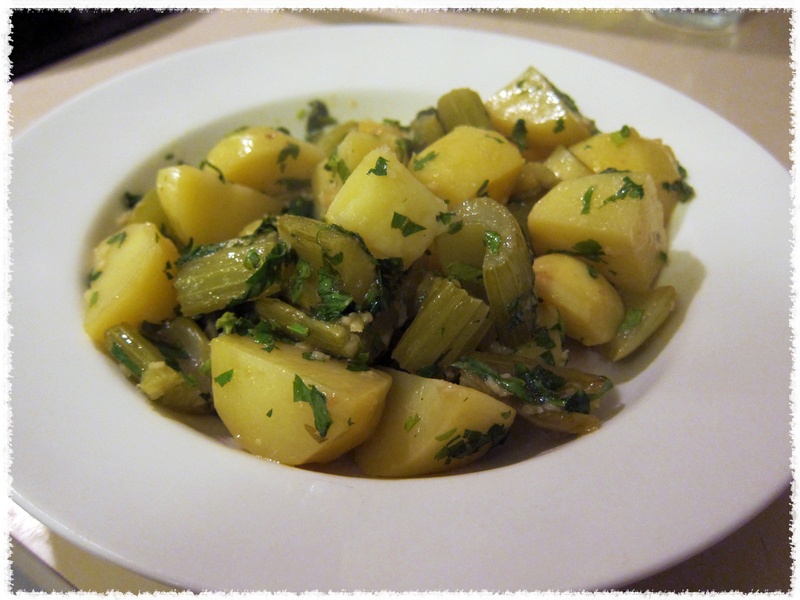 And it’s very easily veganisable – just replace the butter with olive oil and away you go. Vegan French food win! Deb serves her mushrooms over egg noodles, but I had mine with mashed potatoes and I’m calling it perfection. I did eat the leftovers with parpadelle the next day, and that was damn fine, too. Just pick your favourite carb and get to it. Heat a good sploosh of olive oil, or a combination of olive oil and butter, in a large pan. Cook the mushrooms on high until they colour, but don’t soften. Remove from the pan and set aside. Saute the onions, carrots and thyme over medium heat until the onions colour. Season with salt and pepper. Add the garlic and cook very briefly. Pour in the wine and stir, scraping the stuck bits off the bottom. Bring to the boil and allow the liquid to reduce by half. Stir in the tomato paste and the stock. 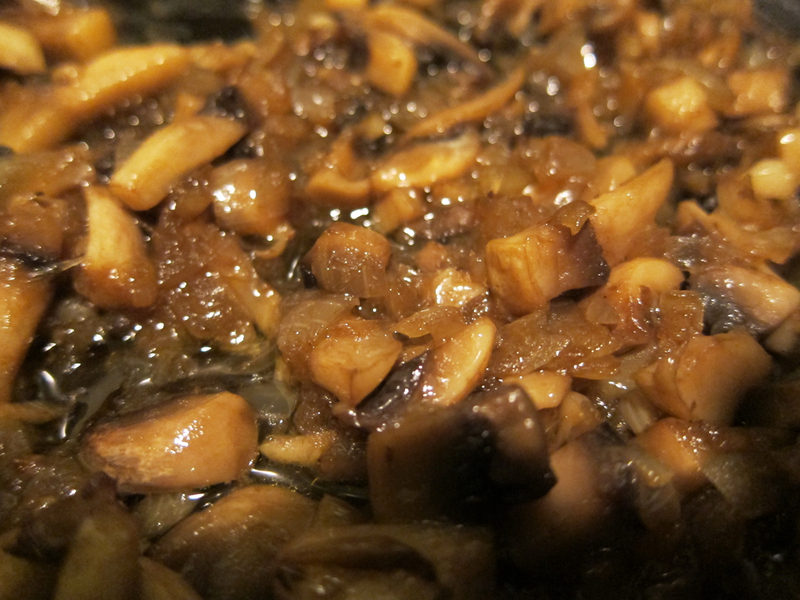 Add the mushrooms and any liquid they released, and simmer for 15-20 minutes. Mix the flour with 1 tblsp of butter or oil, then add to the stew. Simmer over low heat for around 10 minutes, or until the sauce is a thick gravy. Taste, season if necessary, and spoon over the carbohydrate of your choice. Top with a good sprinkling of the chopped parsley, pour yourself a nice glass of red, and snuggle up near a heater while you eat. You’ll wish winter would stay forever.